The very idea was laughable when I first visited in 1995. I'm not laughing anymore. 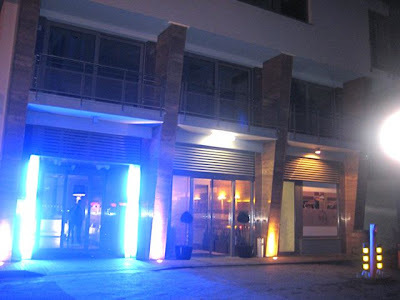 With restaurants like Ristorante Rialto, two Brabander restaurants, and U Kastelána (which I have not tried), there are now some diverse and interesting options. 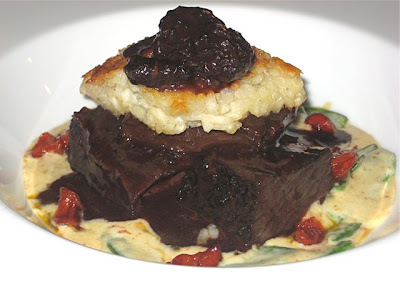 I recently got a recommendation to try Borgo Agnese -- a place that opened earlier this year on the street level of a building of new luxury flats. The dining room had a number of different sections. Ours had fairly bright lighting. 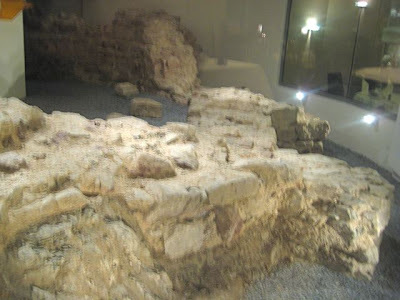 It was next to an ancient section of a wall that had to be preserved as a condition for building the hotel. There were other, more intimate areas with lower lighting. There was a big party in one room that V said was filled with Czech celebrities, including the voice of the Czech language Bart Simpson (ironic since I mentioned the same person's photo was on the wall in my recent post about La Bodeguita del Medio). The table was nicely set. The service was efficient and friendly, but not overbearing. 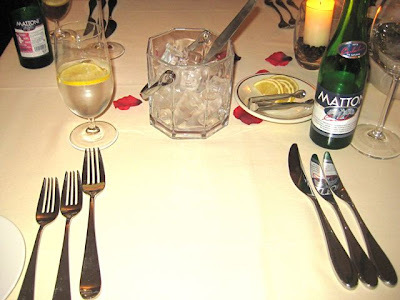 The waiter even brought a small bucket of ice with our Mattoni mineral water (30 CZK). 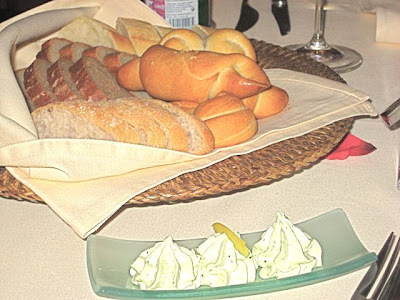 We received a bread basket with a wide variety of relatively ordinary breads. There was whipped garlic butter on the side. We both got an amuse bouche -- a spoon full of slightly smoky beef mixed with a creamy cheese. Pretty good. 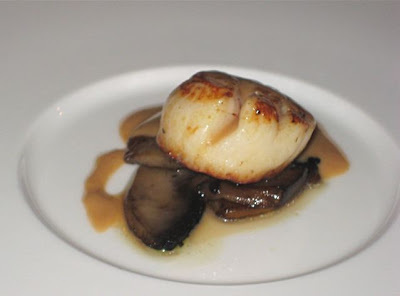 For a starter, V got the seared scallop (169 CZK). It was large, but there was only one. It sat on a couple of slices of grilled mushroom -- nothing exotic, but flavorful. I liked it. 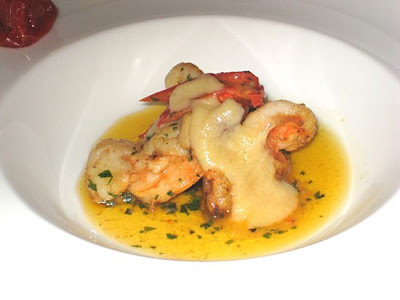 I had the shrimp trio with sun-dried tomatoes, olive oil, and garlic confit (195 CZK). The shrimp were good, but small. I soaked up all the garlicky oil with some bread. 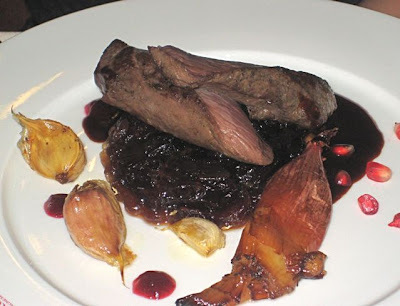 For a main course, V ordered the grilled venison sirloin with a plum tart, shallot confit, and a juniper berry and Port sauce (459 CZK). The meat was lean but tender. But the tart was cloyingly sweet -- not a good balance there. V liked the shallots. I got the roasted beef ribs with red wine, mushrooms, pea pods, caramelized carrots, and risotto-like cake on top (290 CZK). We both liked this much better than the deer. My friend recommended this specific dish to me. It was good, but not up to the standard of the beef ribs I had at Maze by Gordon Ramsay. But these were half the cost, which made the dish feel like a good value. One thing struck me as odd. The waiter asked how I'd like the ribs cooked. I didn't know what to say. I assumed they were braised -- and on arrival, that appeared to be the case. They were fork-tender and cooked all the way through. V drank three .1 liter glasses of the house Riesling (30 CZK each). She said it was simple but good. The total bill, including a cover charge of 25 CZK a person, was 1328 CZK. We thought was a good meal, but not great. It's not a place we'll go out of our way to visit again. We really like the Brabanders a bit more. 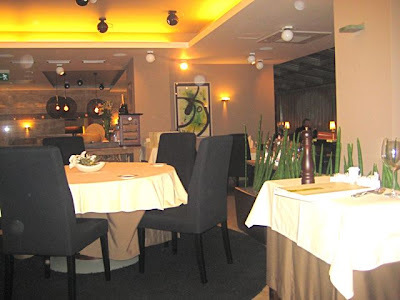 It is also worth noting that as the quality levels and number of choices continue to climb, the prices in Brno restaurants are getting close to those in Prague. And that, my fellow travelers, is not a laughing matter. 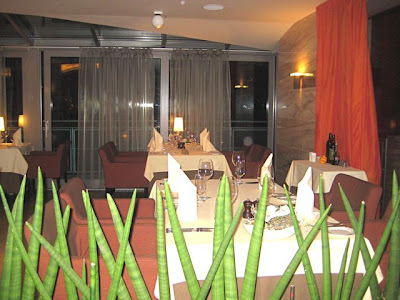 I could never imagine a bill of ~ 1500ck for a dinner for two in Brno! Just to let you know, Borgo Agnese is not a part of "new hotel" but of a luxury apartments called "Residence Anenské terasy"